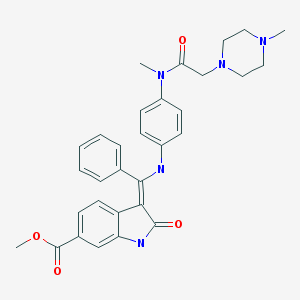 Ofev (nintedanib) is an anti-fibrotic drug for the treatment of idiopathic pulmonary fibrosis (IPF). The drug is manufactured by Boehringer Ingelheim. Ofev was approved by the U.S. Food and Drug Administration (FDA) in October 2014 and by the European Commission in January 2015 as a drug to treat IPF, following positive results from clinical trials (the INPULSIS Phase 3 study was the most decisive trial leading to the therapy’s approval). In previous trials it was observed that the drug slowed disease progression by reducing the rate of decline in lung function (as measured by Forced Vital Capacity, or FVC) by 50 percent. The drug also reduced rates of adjudicated acute exacerbations by 68 percent. The INPULSIS trial involved 1,066 patients from more than 24 countries and was considered to be a major factor in the drug’s eventual approval. Ofev inhibits tyrosine kinase, an enzyme essential for signal transduction pathways that trigger growth factors like vascular endothelial growth factor receptor (VEGFR), fibroblast growth factor receptor (FGFR), and platelet derived growth factor receptor (PDGFR), which are secreted in excess amounts in patients with IPF. These growth factors promote collagen production and deposition and control the differentiation, maturation, and proliferation of the fibroblasts, which eventually lead to the formation of scar tissue in the lungs. Ofev binds to the phosphorylating site of tyrosine kinase, which blocks the cell signaling mechanism, slowing the progression of the disease. Ofev has been approved by public health regulators and is considered to have an established safety and effectiveness profile. The next step for Boehringer Ingelheim is to determine the drug’s long-term effectiveness in managing IPF. At the 2015 International Conference of the American Thoracic Society (ATS), the company presented new data from the Phase 2 TOMORROW trial where patients were given the option to continue treatment with Ofev until they had completed the 52-week treatment period. The data shows the effect of the drug on slowing disease progression for up to 76 weeks. The results from this study were positive, showing that Ofev reduced the annual rate of FVC decline. A new analysis of INPULSIS studies reinforced Ofev’s ability to slow disease progression in lung function decline and death. It has also shown a significant reduction in the risk of acute flares reported as serious adverse events. One-year data from post-marketing surveillance that included 6,700 patients taking Ofev confirmed the drug’s safety and tolerability profile seen in former studies. Additional analyses of the INPULSIS study showed that Ofev slows the progression of pulmonary fibrosis regardless of the initial state of the participant, as measured by lung function. Boehringer Ingelheim says the recommended dose for Ofev is one capsule of 150 mg twice daily (300 mg per day). It is advised that patients take the capsules with food during or immediately before or after a meal. For patients who don’t tolerate the recommended dose of two 150 mg Ofev capsules per day, the daily dose may be reduced by their doctor. The most common adverse side effects of the drug are diarrhea, nausea, abdominal pain, vomiting, liver enzyme elevation, decreased appetite, headache, weight loss, and hypertension. Ofev is not recommended for patients with moderate or severe liver impairment. In patients with mild liver impairment (Child Pugh A), the recommended dose is 100 mg twice daily approximately 12 hours apart taken with food. In these patients, liver enzymes (ALT, AST) and bilirubin should be monitored before and during treatment. The safety and effectiveness of Ofev have not been studied in patients with severe renal impairment and end-stage renal disease. Ofev may cause harm to the fetus and women should be advised about this potential risk. Breastfeeding while using Ofev is not recommended. Note: Pulmonary Fibrosis News is strictly a news and information website about the disease. It does not provide medical advice, diagnosis, or treatment. This content is not intended to be a substitute for professional medical advice, diagnosis, or treatment. Always seek the advice of your physician or other qualified health provider with any questions you may have regarding a medical condition. Never disregard professional medical advice or delay in seeking it because of something you have read on this website. I’ve been taking Ofev since the first of this year. Only side effect I have noticed is stomach cramps, diarrhea and loss of appetite! Did not mind the loss of appetite at all, needed to lose a few pounds anyway! Loss of weight has helped me breath better! Been eating anti-diarrhea pills like candy, they do help! I have had pulmonary fibrosis for several years. The VA found it, but since I also had some spots in my lungs they staid focus on they. They did at least 2 biopsies of the non life threatening spots. It came back benign. All the time ignoring my PF. I finally saw a private pulmonary specialist I had faith in. The first thing he did was put me on O2 full time. I refused the portable at the time because I did not want any see me with that canula in my nose. BUT I realized I needed full time. Hi my mother has pulmonary fibrosis she’s on 100mg twice a day she’s been on it for 4months she says no changein in her breathing can you please tell me how long does it take to work? No one in Singapore knows about this drug. Please recommend. Hi, my mother was just diagnosed with IPF could you send the medicine we would be very grateful. I have been taking ofev since january 2017 , the told me the good results from the investigation were only for 18 months and no body knows what happen after , for how long should I take ofev for good results , tell me if there are some news on the long term prescription.